Gurgaon: Collector or circle rate is the minimum price at which a property is registered when being transferred and it is a major source of revenue for the government, in terms of stamp duty. After a gap of four years and almost two months before the next financial year 2018-19, the district administration of Gurgaon has revised its circle rates and the same will come into effect from Monday, February 12, 2018 and remain effective till the end of financial year i.e March 31, 2018. A committee headed by the deputy commissioner and comprising revenue department officials recommended an increase in the circle rates, which is a regular exercise of the local administration. This hike is maximum in retail and commercial sparing the residential because allocation of different localities has been done in different slabs. In the commercial category, the highest increase in circle rate has been from Rs. 1,40,250/sqyd to Rs. 1,50,000/sqyd in DLF-3, the area which falls between Delhi-Gurgaon Expressway and MG Road. These rates were usually revised in every financial year but now the government has decided to revise it twice a year, following the orders of Haryana Chief Minister Manohar Lal Khattar, the Deputy Commissioner mentioned. This is a good step taken by the government as the real estate is revising fast after RERA, GST rate cut and focus on affordable housing. 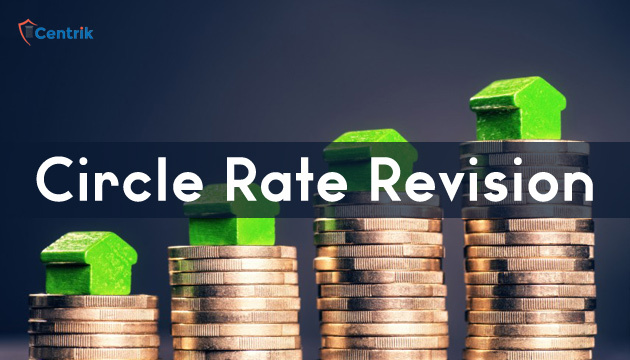 Revision in circle rates is a symptom that property transactions are increasing and the government is thinking to increase revenue since it will affect further sale, purchase and registry. But keeping in mind the schemes like Make In India, Startup India to attract more business into the country, government could have postponed this revision because property rates will go up and may discourage the schemes.